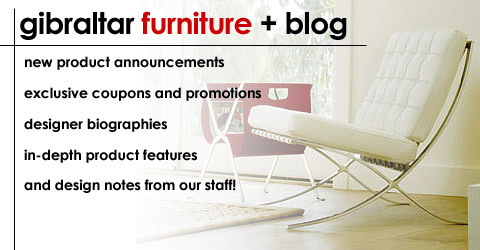 Zuo Modern full catalog is now available at Gibraltarfurniture.com with Free Shipping options. Zuo Modern Furniture features modern and post-modern furniture for living room, dining room, and office. Highlights of this line include: imported Italian leather on many models, and futuristic design. The Zuo Modern series includes: chairs, sofas and love seats, ottomans, lounges, barstools, beds, dining tables, occasional tables, folding chairs, and storage units. GibraltarFurniture specializes in modern classic designer chairs. Browse our complete selection of modern chairs such as barcelona chair, modern office chair, chaise lounge, modern stocking chair and more modern furniture designers and manufacturers.Gibraltar Furniture has been in business for 50 years. Yahoo News reports that Gibraltar Furniture has “The best prices, models, and service of any site on the Internet.” Yahoo News, click here. Yahoo News reports that Gibraltar Furniture is an “Secret Weapon Web Site for blue chip merchandise at warehouse prices Yahoo News, click here.